A working dog with rangeland goats. MORE Australian working dog owners and breeders are needed to help a unique research study investigate the traits and genes that make Kelpies, Collies and Koolies invaluable on livestock properties. AgriFutures Australia’s Emerging Industries program is helping a University of Sydney team continue a project to measure and record behavioural and health attributes of Australian working dogs for the first time. The project’s aim is to create a database of Australian and international livestock working dogs with their particular temperament and working traits, potentially leading to estimated breeding values for specific dog abilities and behaviours. But more data is needed and working dog owners are being urged to complete a survey to list the behavioural traits and attributes of their dogs. The owners of about 800 dogs are already involved in the project, but more are needed. 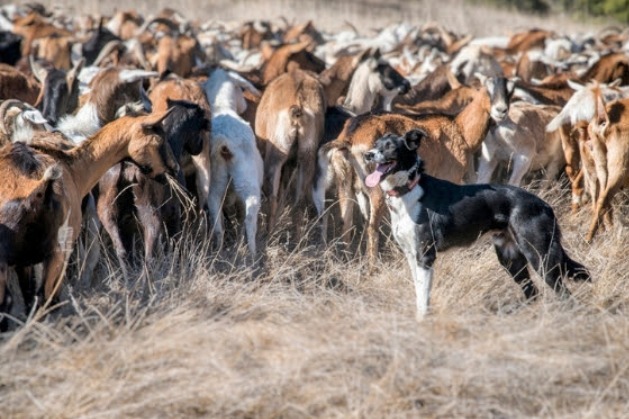 The University of Sydney’s chair of Computational Biology and Animal Genomics, Claire Wade, said an estimated 83,000 dogs are working on Australian farms and their contribution to the rural economy is significant but poorly understood. “We are looking to improve the selection process of livestock working dogs to better suit the needs of the farmer and working dog breeding community,” Professor Wade said. “Behavioural attributes have considerable impact on the success of young dogs in the training program, the length of the dog’s working life, and whether it is ultimately chosen as a breeding animal. “Similarly, health considerations have profound economic impact on the individual dog’s working life,” she said. It will determine how dogs (whether registered studbook animals or not) reflect characteristics of parents, and traits such as barking will be mapped, so breeders and farmers can select dogs to suit their needs. “What suits one person may not suit another and if a dog is required for loading trucks that will be different to a dog needed to muster a large paddock alone while the farmer waits at the gate,” Professor Wade said. “The breeding and training of successful farm dogs is a complex enterprise, not least because they are selected for at least two different contexts: station work and trials. “For breeders, the results of the study should assist in identifying potential breeding matches to allow outcrossing without losing the working attributes you value,” she said. AgriFutures Australia Emerging Industries Program manager Duncan Farquhar, said the survey provided a unique opportunity to create a database of Australian and international livestock working dogs with their particular temperament and working traits. “This will be a powerful resource for working dog societies to learn more about how these traits are passed on from parents to progeny and also to investigate the genes responsible for the valuable behaviours. “We urge farm dog owners to get involved,” Mr Farquhar said. “The information you give about your dogs will not be connected to your name or your dogs’ names without your permission. “Dogs are assigned a number to de-identify them from their names and their information goes into a pool of data comparing dog behaviour and genes. How you score your dog or what genes emerge will not be made public,” he said. The project is building on a previous AgriFutures Australia project Valuable behavioural phenotypes in Australian farm dogs completed in 2015, funded to support and increase the contribution working dogs as an industry make to Australian farmers. The latest project is funded by AgriFutures Australia and the Working Kelpie Council of Australia.